Health is the supreme value of society However, morally and physically outdated medical care facilities are not able to meet the objectives fully. That is why the republic pays much attention to the processes of renovation and modernization of facilities in the health sector. Plenary Talk "Healthcare Architecture - 2030. Key Trends Forming the Future of the Human Health" opened the conference. "Dear guests, participants of the conference and experts. Today in this room there are people who can contribute to the fact that we we lived not only long, but happy life. These are people who are responsible for construction, engineering, design, maintenance and reconstruction of health facilities. Improving the quality of life is the sense of Tatarstan Strategy 2030 within the given Federal agenda, - the Head of Tatarstan Investment Development Agency Taliya Minullina greeted the guests. - The availability and quality of medical services is not only the qualification of health care workers and world-class equipment, but also the institutions of new type. The need in sharing expert opinions and attraction of private funding is increasing. Today the best conditions for it are created in Tatarstan!" The Minister of Construction, Architecture, Housing and Communal Services of the Republic of Tatarstan Irek Faizullin expressed his confidence that once again the conference will become an excellent platform for expert discussion of new technical, constructive and architectural solutions, advanced development, development prospects of the construction industry and health care system. He expressed his wish for successful and constructive work to everybody. Prior to the plenary session the participants could become familiar with innovations in medical technologies. Within the conference, the exhibition of medical equipment, devices and technologies was held. On two screens in front of the entrance of the meeting hall, the visitors could observe how the doctor makes incisions on human organ. This presentation was organized by Kazan company Sun Com. The Vice President of the American company HKS Shannon Kraus, in his turn, as an example of high technologies has shown the way of sending an EKG from the phone to the doctor. Indeed, various apps that can count the number of kilometers traveled, calories burned and so on, have already become casual. Comfortable environment contributes to effective operation of the medical staff and speedy recovery of patients. That is why such conferences are of high importance for the medical community from different countries. The conference MES 2018 gathered more than 350 representatives from Russia, the USA and the Netherlands. 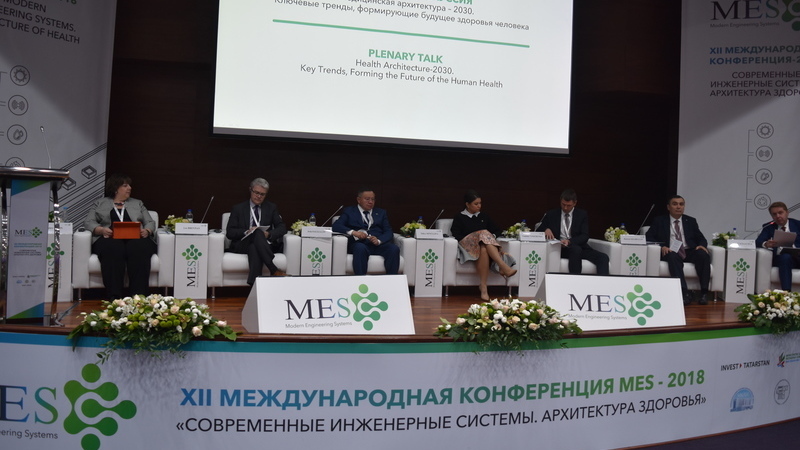 The organizer of the event is Tatarstan Investment Development Agency together with the State Autonomous Healthcare Institution "Interregional Clinical Medicine Center" with the support of Kazan State University of Architecture and Engineering.